The loss has continued since the end of the Arctic summer, despite cold weather across the northern hemisphere. The warm 2007 summer saw the smallest area of ice ever recorded in the region, and scientists say 2008 could follow a similar pattern. Older floes are thicker and less saline than newly-formed ice, meaning they can survive warm spells better. Ice more than two years old now makes up about 30% of all the ice in the Arctic, down from 60% two decades ago. The shrinking of Arctic ice has global implications, as its white surface reflects solar energy back into space whereas the open ocean absorbs it. 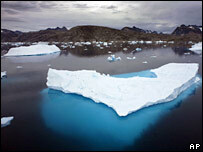 March is the month when the Arctic ice usually reaches its largest extent, as the dark winter nears its end. Nasa's data shows the area covered by ice is roughly the same as it was last year; but this masks a significant change. "Although this March the area is slightly larger than last March, the area of [thick] perennial ice has reached an all time low," said Seelye Martin, manager of the Cryospheric Sciences Program at Nasa headquarters in Washington DC. "So the volume of Arctic ice continues to decrease." The loss of old, thick ice has continued through the winter months, despite the unusually cold weather deriving from La Nina conditions (the other extreme of the El Nino Southern Oscillation) in the Pacific. The winter ice loss is thought to be driven mainly by the transport of old floes from Arctic waters out into the Atlantic Ocean. The currents driving this are stronger than usual as a consequence of another natural cycle, the Arctic Oscillation. The net result is that most of the cover consists of ice that has formed since last summer. The scientists behind these findings believe this year's cooling should not obscure the long term warming trend, with temperatures across the Arctic rising about twice as fast as the global average. "Weather comes and goes, and it's the long term average that really matters," observed Josefino Comiso from Nasa's Goddard Space Flight Center. Dr Comiso said he believed that the change of albedo - the change from a white, reflective surface of ice to a dark, absorbing surface of sea - was already happening. With the ice pack containing such a high proportion of thin, salty ice, the scientists believe another major melt is likely in the summer. "It's becoming thinner and thinner and much more susceptible to melting during the summer - much more likely to melt away," commented Walt Meier from the National Snow and Ice Data Center (NSIDC) in Boulder. Last summer, the sharp melt meant that the Northwest Passage, the fabled navigation route linking the Atlantic and Pacific Oceans across the top of North America, was easily navigable. The disappearance of ice cover has countries around the Arctic eagerly eyeing the mineral reserves that may become accessible. Most projections of climate change in the Arctic suggest the ocean may become ice-free by the middle of the century, but one forecast released late last year said it could happen by 2013.